I arrive at the Amtrak station in downtown Tucson a bit after 5PM and check in at the wicket. The man tells me the train is running a bit ahead of schedule, so I will be able to board early (whatever that means). I’m glad the waiting room is air conditioned, since the Sun is pretty intense this afternoon. Maynard’s Market is next door to the Amtrak waiting room, and they also run a restaurant that is quite popular. I can smell the food, but I’m really not hungry after my late lunch. The other end of the terminal has a couple of shops and a railway museum, including a steam engine under cover and statues of Wyatt Earp and Doc Halliday. 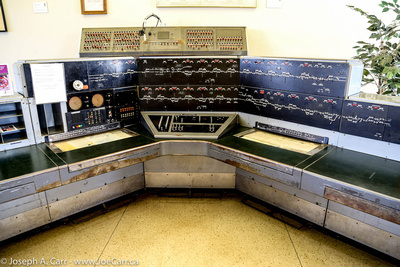 There is an old centralized control station, which was used to control the trains in the area. People watching in the waiting room is entertaining: a guy is wearing a zipped-up parka and talking loudly to himself; a young, gay, black guy floats into the room hugging his pillow; an intense guy stares at everyone who enters but doesn’t say a word; and an obese young woman loudly talks non-stop to her skinny friend about her life trials for all to hear. One guy approaches me to look up on my iPhone where the Greyhound station is, since he wants to get to Roanoke, Virginia by bus. He mumbles about taking a taxi since it is too far to walk, but I later see him board my train. By 6PM some regular folks finally start to show up! The train arrives at 7:45PM and after a few people get off, I board my sleeping car and find my Roomette. My car attendant made an 8PM dinner reservation for me before I even boarded the train, which is great service and very welcome, since I really didn’t expect to have dinner onboard. The train leaves a bit early at 8:20PM and last call for dinner ends up happening while we are still in the station. After dinner my car attendant makes my bed so I can settle in for the night. We stop in Maricopa just after 10PM to pick up passengers, and then it is quiet time aboard my sleeping car. Despite being on the north side of the train, I see the crescent Moon from my Roomette window. I’m relaxed and ready for bed. We are scheduled to arrive at 5:35AM Pacific Time in Los Angeles, so I set my alarm on my iPhone for 4:00AM Mountain time to give me some time to prepare to detrain in LA. This entry was posted in Arizona and tagged train. Bookmark the permalink.